Can you believe we are halfway through the first month of the year? We are so out of it around here. I am seriously having a hard time getting back into the swing of things, and mostly find myself fantasizing about vacation. And wine. And dessert. Sigh…. Anyways, blah, blah, blah! Did you already see that I have been soup cleansing?? 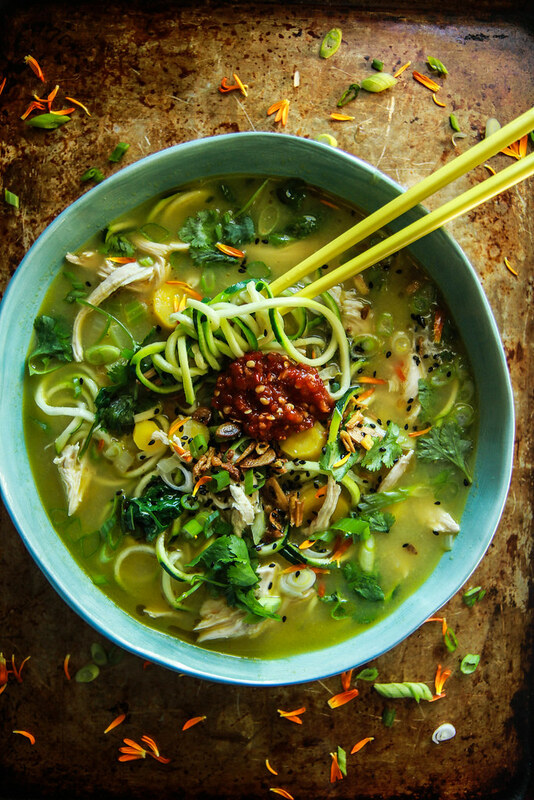 Well, this Asian Chicken Zoodle Soup is just next level “souping.” It’s also next level for all of it’s incredible flavor. 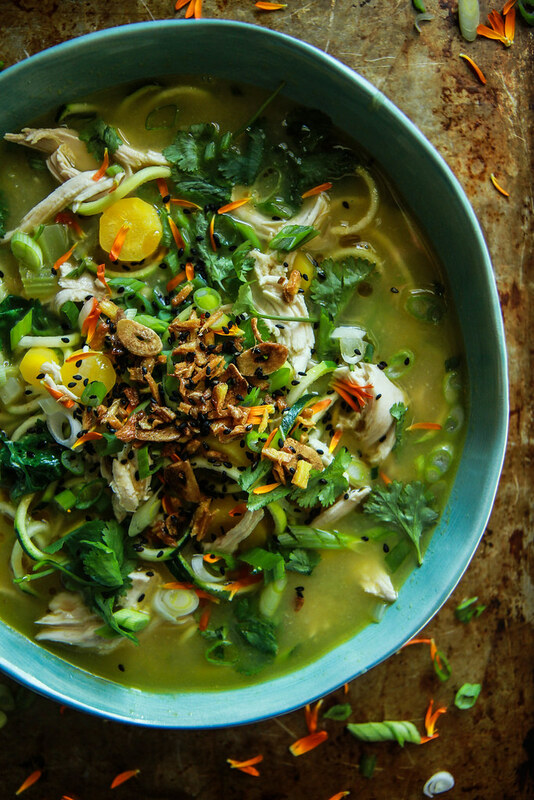 The ginger, garlic, sesame and fresh green onions and cilantro add SO much to this brothy soup. And the zoodles truly satisfy the cravings for real noodles! You have got to try this soup, which also happens to be very easy to prepare- it is the perfect weeknight meal and heats up really well for lunches the next day! Oh and please, let the New Years requests keep coming for any of the types of recipes that you would like to see here this year! In a large pot over medium-low heat add the sesame oil, garlic and ginger. Carefully watch the garlic and ginger, stirring often until they are golden and crispy. If you need to turn the heat to low than do so to make sure that the garlic does not burn. This should take about 5 minutes. Use a slotted spoon to remove the ginger and garlic from the pot, reserving in a small dish. Keep the pot and oil over medium heat and add the carrots, celery and yellow onion. Stir and sauté for about 3 minutes and then add the chicken broth. Bring to a simmer and add the chicken. When the soup has come to a simmer again, add the zoodles and then season to taste with kosher salt. Serve the soup up hot in bowls and sprinkle the top with green onions and cilantro and a little bit of the crispy ginger and garlic. Add a few sesame seeds and a tiny drizzle of sesame oil. If you desire add a dollop of sambal for spiciness! Enjoy! What an amazing fresh soup! Such a pretty and delicious looking soup. Happy New Year! This looks so good! I need the soup cleanse then I’ll give this a try. For the new year, you’ve already answered one request– simple soup ideas. I also love your salad ideas (or even just inspiration for homemade dressings). We have been using your honey mustard on just about everything. Please keep your beautiful cocktails coming as well. Hi Heather – just found your site and love all the recipes and advice! What type of spiralizer do you use? I have two and my zucchini noodles look nothing like your zoodles. Thanks and Happy New Year! Hi Stacy!! I love the inspiralizer- that is my favorite brand! is it strong enough to do sweet potatoes also? Hi Karen- I bet sweet potato noodles would be delicious! This soup looks truly amazing! Loving all the delicious flavors! I’m obsessed with zucchini noodles! The flavor sounds amazing! Loved the soup!! next time I think I will put the ginger in the broth instead of browning it as a topping, just wanted more infused ginger flavor. Am making again tomorrow and making a double batch!! Oh good Sylvie! Glad you liked it and I am always excited for more ginger! Love how healthy this soup is! Pass me a bowl! hi heather – loving the look of your recipes! Do you have a good chicken broth recipe to use in this one? This looks incredible! I’m putting this on our menu this week and linking to it from my blog! This is such a wonderful soup and so quick to throw together! Thanks for the recipe. I am on day 5 of Whole30. We can do this! I’ll definitely be going back for seconds with this soup!! Thanks for the great recipe – it was filling and hearty even though I omitted the chicken (and used veggie broth) for a vegan version. 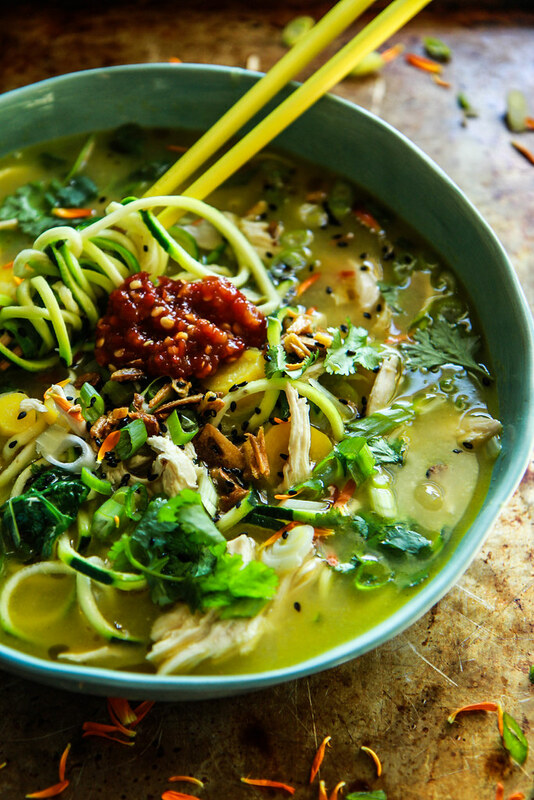 Love this zoodle soup Heather! Love the incredible flavors going on in this soup! I need to make this asap! First time I’ve ever made soup and it was so easy and it came out fantastic! I’ve been making variations of it twice a week haha. All the recipes I’ve tried from you came out absolutely perfect, I’m in love with your recipes and thank you for brightening my days with great meals. Can’t wait to get my hands on your book this fall! So nice Jack!!! Thank you so much! My name is Frank gluten free and lactose intolerant,try some of your recipes very good thank you, Trying to make risotto shrimp rice dish chicken stock and white wine if you have any suggestions. Excellent soup! Even my fussy eater granddaughter loved it.